Rodeo Drive in Beverly Hills styles itself as the intersection of luxury, fashion, and entertainment—a tourist mecca where well-heeled shoppers flock to make five- or six-figure impulse buys. For a select group of L.A. watch collectors, proximity to this exclusive retail district means having one of the world’s great timepiece capitals in their own backyard. There are signature stores from Swiss horologists Breguet, Hublot, and Panerai and watch dealers such as Gearys Beverly Hills, Westime, Tiffany & Co., and Harry Winston. You can begin by trying on a deluxe chronograph with the sticker price of a 2015 Toyota Camry and work your way up to a diamond-encrusted dress watch that costs as much as three new Ferraris. It takes a certain kind of collector to seek out a limited-edition watch so rare, he may be the only American to own one. These men—yes, most collectors are men—have money, of course, and they share an obsession with intricate machinery, elegant design, and pursuit of the elusive. Some call them “watch idiot savants,” and there are even WIS jokes. Ever hear the one about the WIS who memorized all the Rolex serial numbers but couldn’t remember his wedding anniversary? Or the WIS so besotted with his watch that he lost track of time? Ask a watch fanatic, meanwhile, and he’ll take umbrage at any suggestion he is narrow-minded. He sees himself as a man of the world and his watches as emblems of sophistication. He will also tell you how unfailingly punctual he is. For a serious collector watches aren’t about telling time so much as transcending it. Whether he yearns for Timex wind-ups of the ’50s or solid middle-class Hamiltons of the ’60s or the upper echelons of what Breitling and Audemars Piguet offer today, these men lust for the everlasting. Friendships may fade, business partnerships may sour, marriages may disintegrate, and generations of iPhones and digital Apple watches may be sent, soon enough, to e-waste disposal sites. A love affair with a classic timepiece is futureproof. Returning to L.A. in 1992, he landed a job at Luma, a trendsetting Santa Monica restaurant, where eggs, sugar, butter, and most animal protein were banned from the menu. “They didn’t serve beef or dairy,” Ruvelson says. “I was frustrated.” The environment seemed designed to dash the dreams of a young chef steeped in the French classics. Six months later Ruvelson quit the restaurant, forever walking away from cooking as a profession. 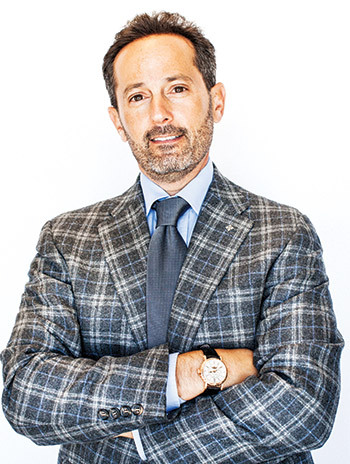 Plunging into real estate, he bought his first property at 23 and began building a series of investment funds to acquire multi-unit housing in Greater Los Angeles. As his business grew, he gained the means to purchase a Rolex and then many more Rolexes than he had wrists. He also amassed a collection of new and vintage Italian sports cars. On a recent summer afternoon, Ruvelson invites me to the Beverly Hills office of the Icon Company, the real estate firm where he is a principal, to show just how committed a Patek enthusiast he’s become. His beard is slight, accenting more than concealing the fine-boned architecture of his jawline. A gold Calatrava Cross—a symbol of medieval Spanish knighthood that Patek adopted as its own at the end of the 19th century—glimmers on the lapel of his gray tweed jacket. 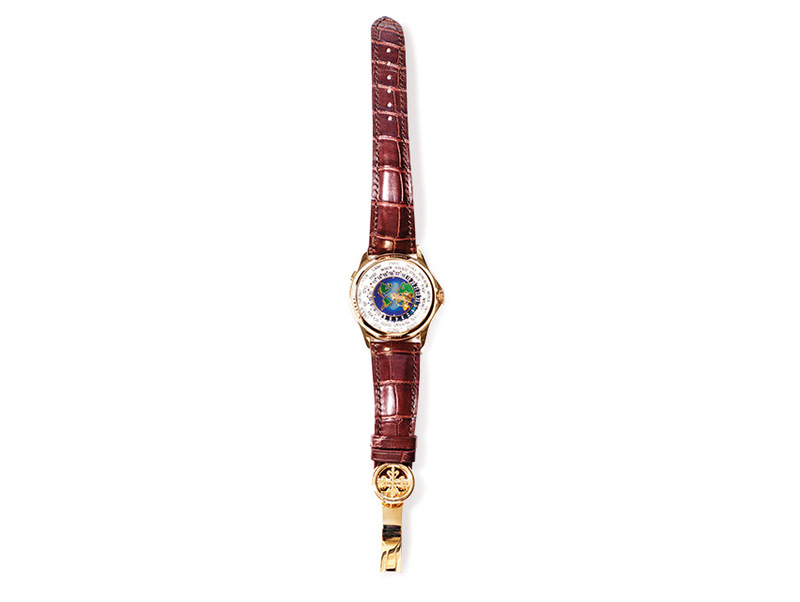 Some of Patek’s most desirable limited editions are available only by formal request. Ruvelson’s petitions are evidently looked on with favor. 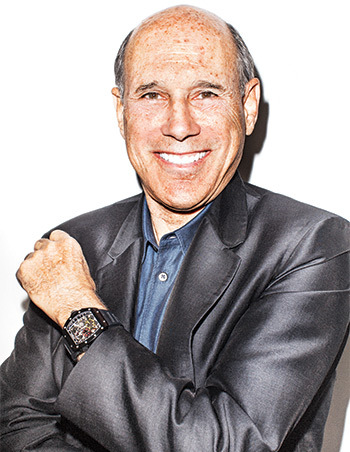 According to Jonathan Martinez, a sales specialist at Gearys, there are watches that would never have been sent to the store—and might not even have made it to the United States—had Ruvelson not been the designated buyer. Midway through Ruvelson’s guided tour, his Calatrava Cross starts to resemble less a company logo and more a symbol of consumer knighthood. Buying a Patek, as Ruvelson describes it, can be an ennobling experience. “It’s about becoming part of the Patek history, the Patek culture,” he says. Ruvelson is confident that “with just some routine maintenance and care, these watches will last 100 or 200 years. They will way outlast me.” He remains unmarried, without children, which raises a central Patek question: Will there be a next generation of Ruvelsons to look after the timepieces when his stewardship comes to an end? He laughs when I ask and accuses me of secretly talking to his mom. “Who knows?” he says. “Maybe because of this article I’ll find the right wife and we’ll have children to give my watches to.” The clock, as they say, is ticking. In Los Angeles Jeff Hyland is the dominant force in what some might call “extreme residential real estate.” He had a hand in selling Aaron and Candy Spelling’s former estate for $85 million. His company, Hilton & Hyland, landed the $135 million listing for William Randolph Hearst’s former Beverly Hills digs—29 bedrooms, 40 bathrooms. Also listed on the firm’s Web site this summer was a cute three-bedroom, two-bath number in Pacific Palisades that was essentially a $25 million tear-down. People in the market for such houses tend to be movers and shakers. Hyland is good at cultivating this type of customer, and his watch preferences reflect a similar currency. Don’t get him wrong—he has enormous respect for heritage brands like Patek, but they don’t much interest him. “I’m more into the fun of the here and now,” he says. When it comes to timepieces, what “fun” means to Hyland are see-through skeleton watches or, as they’re often described, “race cars for the wrist.” Like a Formula 1 vehicle, the extreme skeleton is a precision-built machine designed by technicians who don’t so much follow tradition as tear it to shreds. It can perform functions that even the most imaginative watch freaks might deem impossible were the proof not visible through both sides of its clear case. Extreme skeleton watchmaking is only about 15 years old, launched by a handful of maverick companies, most in Switzerland. Production is low. 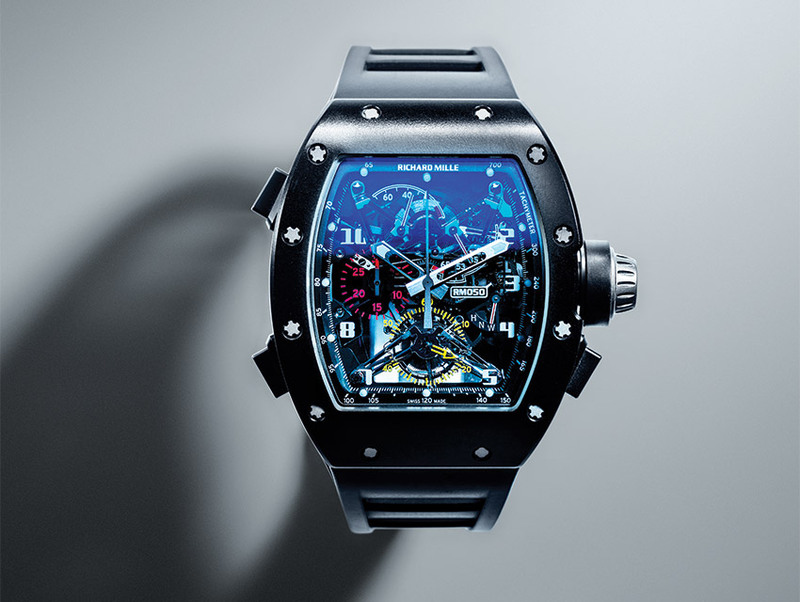 Richard Mille, the leader in the field, makes fewer than 4,000 pieces a year. Prices are stratospheric: The cost of entry can be more than $70,000, and things go sharply up from there. Hyland is slightly built. His forehead, made larger by male pattern baldness, tends to amplify the assurance of his smile and dark brown eyes. He conveys his enthusiasm in hushed tones as he begins a survey of his collection. 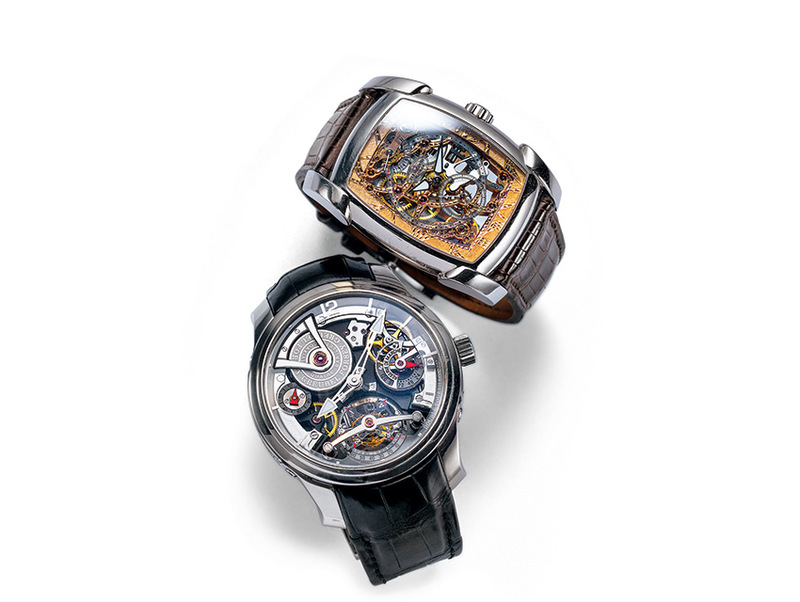 He straps on the black alligator band of his Double Tourbillon 30° Technique by Greubel Forsey and winds it to life. Hour markers and platinum hands float almost to the surface of its transparent case. One antigravitational chamber rotates inside another. The wind-up power plant consists of four coaxial mainspring barrels, including a 120-hour energy reserve. There is something transfixing about all this visibility, unencumbered by an actual watch face, and also something disorienting, as if this timepiece has emerged from a steampunk fever dream and somehow landed on Hyland’s wrist. He shows me two extreme skeletons by Richard Mille. Hyland’s rather dressy RM 014 is an homage to the builders of Italy’s Perini Navi shipyards, who have produced yachts for media titans Rupert Murdoch and Silvio Berlusconi. The rectangular see-through case is contoured like a mainsail. Hyland lavishes more time and affection on his limited-edition RM 050, originally designed for Felipe Massa, the Brazilian Formula 1 driver. Its case incorporates a frame of polymer composite shot through with carbon nanotubes. Hyland winds up the watch, and a ghostly golden second hand begins rotating above what appears to be several hundred suddenly awakened gears and levers. A double chronograph, the RM 050 can split seconds. Hyland remembers when John Simonian, founder of Westime and CEO of Richard Mille Americas, gave him his first glimpse of this model. “I just drooled,” he says. He returned a few days later to make the RM 050 his own. “It was love at first sight—and second sight. I had to have it.” Only ten RM 050s were produced for anyone other than Massa. Hyland will wear his only on special occasions, such as when he’s meeting with the actual Richard Mille, the bon vivant French businessman who launched his eponymous brand in the late 1990s. At the Richard Mille boutique, you can see what elevated company Hyland keeps. There are skeleton watches endorsed by tennis champ Rafael Nadal and reigning PGA champion Bubba Watson. There’s actor Jackie Chan’s watch, a dragon slithering around the complicated movement, and a version of the model that Pharrell Williams wore to perform “Happy” at this year’s Grammys, an extreme skeleton featuring a smiling titanium skull. The Omega flagship store in Beverly Hills shut down six years ago, but the main shopping district still hosts what is arguably an even greater center of worship for the brand. Jackmond, on North Canon Drive, is a retail enterprise. Hang around long enough and it appears more like a front for one man’s enduring passion. Jack Khorsandi, the store’s 53-year-old owner, will happily take you through more than a century’s worth of timepieces in their period-appropriate displays, from genteel Edwardian pocket watches to utilitarian Depression-era stainless steel wind-ups to postwar moon-phase models to Omega Speedmaster chronographs made before and after Buzz Aldrin wore one on the moon to a banana-face 1970s Omega Seamaster as weighty as an anchor. One afternoon Khorsandi offers me a seat at the table that takes up a good portion of Jackmond’s tiny sales floor and half fills two tumblers with single malt scotch. (He also has an espresso machine at the ready should a visitor prefer caffeine.) In an accent that’s softened in the 37 years since he fled Tehran, he admits to a zeal for Omegas that even he would call a little out of control. Adding to his personal collection, Khorsandi is on the lookout for watches that have a story to tell. Ask him to choose between an ordinary vintage Omega with a compelling past and a deluxe Omega whose history is a blank slate, and the humbler watch usually wins out. That’s because he sees Omegas less as possessions and more as soul mates. When someone comes into Jackmond to sell a vintage Omega, Khorsandi reaches for the watch as if extending a hand to a friend. In a few minutes he can usually tell what year the watch was built, what part of the world market it was designed for, how few or how many were made. What he wants to know from the potential seller is the journey this timepiece traveled—and the wrists it adorned—before it got to Beverly Hills. Who were the owners of this watch? Where did they grow up? Where did they end up? What were their struggles? What were their victories? What did this watch mean to them? 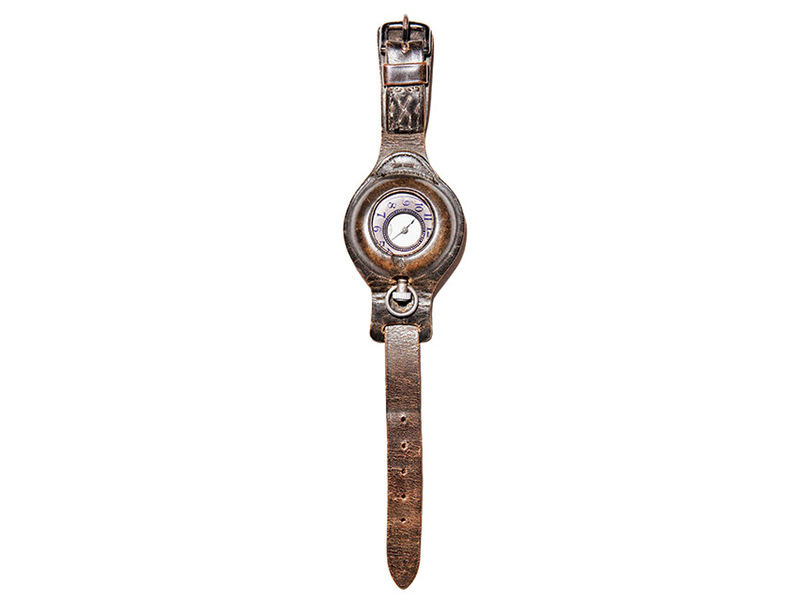 “Sometimes I put on a chronograph from the 1940s that belonged to a pilot,” Khorsandi says. “It doesn’t matter if the watch is working—it will take me to that time, to the plane he was in.” He disappears into the back of the store and reemerges holding a pocket watch with a Star of David painted on the right side of its face. “A long time ago a very old gentleman came in with a small pouch, and he opened it and showed me this,” Khorsandi says. “He told me, ‘I was in the concentration camp, and next to me was a gentleman who had this watch with him, and he left his bunk and he never came back.” The Holocaust survivor asked Khorsandi what it was worth. On the open market? Not much. The piece was on the small side. The case was plain steel; the movement, basic; the condition, understandably rough. Khorsandi said he couldn’t put a price on it, but whatever the visitor wanted for it, he’d give it to him. A plain Omega pocket watch from that era typically fetches around $300, but for this one Khorsandi paid in the neighborhood of $1,500 to $2,000. Khorsandi’s determination to discover the intimate details of the Omegas he buys is linked to Omega’s role in his own life. Some have called the reign of the last shah a golden age for Iran’s Jews. Certainly that must have seemed the case for Khorsandi’s grandfather, whose religion didn’t preclude him from heading the nation’s postal service. In 1962, the year of Khorsandi’s birth, his grandfather celebrated his good fortune by buying a high-end Omega Constellation dress watch. Khorsandi’s father, who was a sales executive for International Harvester’s Iranian operations, eventually purchased an Omega of his own. Khorsandi left Iran in 1978, amid the mass protests that would culminate in the Iranian Revolution the following year. He finished high school in Santa Monica, began selling Macintosh computers out of his bedroom, and became an Apple reseller with strong ties to the music industry. Lionel Richie, Santana, and Michael Jackson were among his clients. Omega history pretty much ends at Jackmond with that colossal banana-face diver’s watch from the disco era. Omega has continued moving with time, but Khorsandi has little interest in anything the company has produced since 1980. The most recent Omegas he treasures are those he might have seen in the shop windows of his youth, before the Iranian Revolution took that youth away. Or did it? 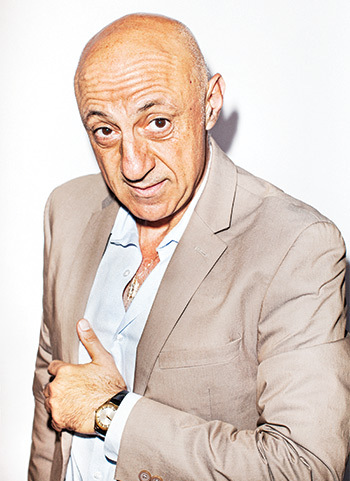 “When a young kid comes into the store,” Khorsandi says, “we will sit down together and talk watches, and I’ll take some timepieces out and we’ll take pictures.” He would never think of shooing away teenagers who are wild about watches. “Some of them are so knowledgeable, so excited,” he says. “I can really see myself in them.” Naturally Khorsandi gives them all the time in the world.